Photograph of the Dai-Ka-Mahal at Mandu, Madhya Pradesh, taken by Lala Deen Dayal in the 1870s. The Dai-Ka-Mahal is a tomb built on the east bank of the Sagar Talao lake at Mandu, a historic ruined hill fort. The tomb stands on a plinth with arched openings, a domed roof and traces of pavilion-topped towers at the corners. This view shows the tomb at the far right beside other buildings with the lake in the foreground. Mandu first came to prominence under the Paramara dynasty at the end of the 10th century, and remained under Hindu rule until the early 14th century when it was conquered by the Sultans of Delhi. Its golden age came as the state capital of the Sultans of Malwa between 1401 and 1531. They renamed the fort 'Shadiabad' (City of Joy) and built palaces, mosques and tombs amid the gardens, lakes and woodland within its walls. The Dai-Ka-Mahal is among the remaining buildings dating from this period. They consitute an important provincial style of Islamic architecture characterised by an elegant and powerful simplicity, believed to have influenced later Mughal architecture at Agra and Delhi. 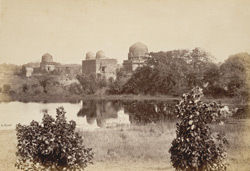 The photograph is taken from an album containing mainly topographical and architectural views of sites in Central India. The majority of prints are signed 'Deen Dyal' and represent some of the Indian photographer’s earliest work.